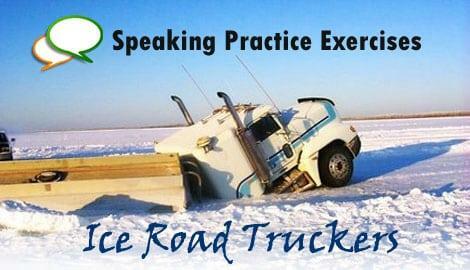 In this lesson, we are going to use an interesting video about a very dangerous job which is called ice road trucking. We are going to show you how to improve English speaking skills with this practice activity. Step 1: Watch the video about how to improve your English speaking skills using this lesson. Step 2: Watch the interesting and suspenseful video about ice road truckers and see what their dilemma is. Step 3: Watch the last video which has questions for you to answer and practice using the new vocabulary about this interesting topic. You will also hear how a native speaker would answer the questions so you can learn some new phrases and additional words. Crack: To break without complete separation of the parts. A crack in a glass, looks like a line. Loader: A machine that is used to move dirt or other materials. Stuck: Not being able to move. Unstuck: When you are able to move after being stuck. Why is the ice weak? Why did the truck get stuck? How thick to you think the ice has to be in order to support a semi truck and it’s trailer? What did they do to get the truck unstuck? Why do you think that these trucks are driving across frozen lakes and rivers? How would you feel if you were driving a semi truck and it started to break through the ice? How much would someone have to pay you to do this job? What aspects of truck driving are dangerous in winter conditions? Please leave a comment with what you thought about this activity to help you improve your speaking skills. This is a new lesson style for us and we want to hear from you! Hi Mouahhidi! Yes this is a very different way to learn English, very different that what you will find in the classroom 😉 This type of activity will help you to use the language and learn how to practice speaking. Trust me when I say that they traditional ways of teaching a language do not work very well. We are trying to give you some new techniques to help you use the rules and vocabulary that you have been learning in school with real life stories. The video is about how two truckers are trying to cross a freezing river. Due to the winter temperatures, the river becomes invisible and they cannot notice the current. They notice it and they try to cross it without the river will start to crack. However, the girl hears how the ice is cracking because one of the wheels of the semi-truck goes through the ice. The semi-truck stucks into it. Finally, her companion helps her. If I were one of them, I will feel very scared. In my opinion, they have a difficult job which requires a lot of courage. The video is about how two truckers are trying to cross a freezing river. Due to the winter temperatures, the river is frozen and can’t see the current. After they notice it, they try to cross it without but it starts to crack. However, the girl hears the ice is cracking as one of the wheels of the semi-truck goes through the ice. The semi-truck is stuck. Finally, her companion helps her. If I were one of them, I would feel very scared. In my opinion, they have a difficult job that requires a lot of courage. thanks for this video I think it is a good way to learn real English but to make it more interesting you should write what the truckers are saying on the video that way the learner listen and read at the same time. Hi Ali. Thanks for your suggestion. Yes the slang is interesting that is true. Next time I will try to find a video that at least has automatic subtitles. May I ask if you tried to answer the questions and what your level of English is? Hi Nguyen! Thanks for letting me know how we can make the lesson better. May I ask what level of English you currently have? What is cool about videos is that you can still understand a lot by watching the video. In this video, the words that the people are using do not explain very much. The basic concept of the video is: There are 2 trucks that need to cross a section of ice, the ice does not look very strong, they are worried about the ice breaking. Later you can see the truck is stuck and they use a machine to push the truck. Even at an intermediate level, you can still give answers to the questions. You may have to look up some new words, but it is possible. Try to keep your answers simple in the beginning and later, try to give more detail. I hope that will help you to understand you can use this activity to practice speaking even if you do not understand everything perfectly. i would like to thank you for creating such helpful teaching aids.I’ve been looking for short videos to practice English with for a long time and i couldn’t find any.these are of great help although it seems to be more appropriate for advanced learners.please keep it up and if you could make simpler versions for learners on lower levels ,that would be awesome. Hi Marjan. Thanks for the feedback about the lesson. Yes you are right, this seems like an advanced exercise; however, to make it easier you only need to give a simple answer. The idea with the activity is that you look up the new words you need in order to say what you need to say. For example, to answer the question: Why is the ice weak? You can say: The ice is weak because there is a current under the ice and the temperature is too warm. That answer contains normal everyday words that an intermediate student should learn if they don’t know that vocabulary yet. That is the the goal of this activity! To discover new words that you should know to start learning how to building your vocabulary to an advanced level. An advanced student can give a more complicated answer, but they should also be trying to use the exact words they want to answer the question. For an advanced student, this activity is best if they provide a very detailed and long answer. Does that explanation make sense? Hi guys, til now you gave us a lot of interesting ideas and some very useful methods how to improve our fluency, but today technique it is something very special. It is helps us to think much easier in English, which is one of the most important goals when we are training to learn a foreign language! Thanks so much, it’s really great invention. Yes Samer, it is a crazy job! Hi Omilef. This is great to hear that you did the lesson! You are right, you will learn a lot of vocabulary when you are trying to speak the answers. We are super excited to hear that you think Real English Conversations is a good choice to learn from! Hi Saga. Yes this is a very dangerous job and I agree, it would be scary. Yes this type of activity takes a lot of time but the idea is to give you lots of time to practice speaking and learning to talk about new topics with new vocabulary. You can make the answers short or long depending on your level and how much detail you want to discuss. I think this lesson style is so useful and helpful. Just after I tried to answer to your questions, I could learn the relevant, more natural English expression from your answers. It’s easier for me to remember the new expressions and vocabularies. This lesson was really exciting. I like it. I’m looking forward to the next lesson. Thanks for taking the time to give us the feedback! We are definitely going to be doing more lessons like this in the future 🙂 It sounds like you are going to have excellent progress with your English because you are doing the exercises! It’s a great activity now i feel much comfortable speaking but what do i need to do after finishing this? Hi Abir! Great to hear that you did the activity 🙂 Many students just read about it and do not experience the progress you can make by doing activities like this. There’s a sample lesson you can download for free to try on that page. What an interesting way of learning English? Thanks for that. I did watch the videos and reached the following summary. The video is about two trucks which are crossing through a ice road in order to reach a remote place.While going so,one trucker (the lady) heard a crack noise and therefore informed her colleague.They got down and noticed that there is a soft or weak part of the ice road. Therefore if they would insist to pass through, the truck and them would have collapsed.The Lady trucker insist a bit to move the truck but unfortunaly one of the wheels of her truck has blocked in the soft part of the ice road .As a result, they called for a loader which helped them to remove the truck by pushing it from back. It’s worthwhile to notice that this job is quite scatty and can jeopardize you. It is what I got from the video. Hi Modeste! Great to hear you tried the lesson. This is a great summary of the short video clip. Actually, a fast pace of speaking though understandable by me, at least, the majority of what is said. The following questions to answer together with the sample answers are great! VERY HELPFUL!!! It’s great help me to understand.